My stallion sprained the suspensories in both back feet really bad during a run. Vet said it would take a year before I could ride him at all again. I used DRAW/Water mixed 50/50 on him, and wrapped him in no bows when I turned him in his pasture. I used the DRAW/DMSO/Water mix with NO wraps at night in his stall. The mixture is a 1/1/2 ratio(example...1 cup DRAW, 1 cup DMSO, 2 cups Water). Vet was shocked when I took him back for a checkup. He sprained in September, and he passed the ultrasound and flex test in December. He was cleared to compete again in February that year. 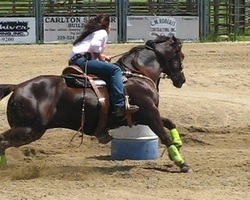 My gelding had loose locking stifle ligaments. He was locking bad in the pasture a few times a day, but if I stalled him he would be locking the next morning just trying to move in his stall, and lock up 4 or 5 times just trying to get him down my 48' alley in the barn. If he tensed up trying to pick up his back feet, he would lock almost every time. I had 4 vets tell me there was "no way" I'd get him fixed without an internal blister, and more than likely surgery to split him...He was 2.5 yrs old when I got him. I brought him home, and use a mix I make of EXTRA Strength DRAW/DMSO on him. The mix is a 1/1/2 ratio…(example 1 cup DRAW, 1 cup DMSO, 2 cups WATER). I also used DRAW Topical(acupressure points for back legs). Three weeks later I stalled him for 3 days because we had horrible weather, and he wouldn't lock at all. I sprayed him with the mix each day, and walked him up & down the alley of the barn twice a day for about 15 minutes because it was too nasty to get out of the barn to stretch. Now, he gets stalled every night, and never locks. 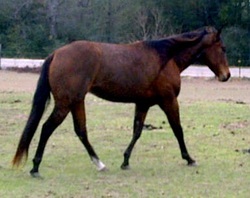 He also had a knee that was the size of a cantaloupe from an old injury as a yearling. He had popped a splint, and damaged his knee when he got hung in a panel. The day I bought him I could see him coming across a 10 acre pasture with that knee. Vets said he was sound, but the size was cosmetic and might never look be normal again. I sprayed it with the EXTRA Strength DRAW/DMSO/Water mix, and used DRAW Topical(front leg points), and 3 months later it went from 40cm around to 34cm around, and now his knee looks totally normal.